Nintendo’s first loyalty club that was launched as Club Nintendo way back in 2002 for Nintendo fans to enjoy, will unfortunately be discontinued later this year, announced Nintendo today. Members of Club Nintendo that still have stars remaining in their account will need to use them before they expire on September 30th, 2015. – April 1st 2015: From this date, Nintendo will no longer include product registration cards with its packaged games, so such products cannot be registered in Club Nintendo. You may still find product registration cards in games that were in stock before this date, however. – April 20th 2015: Termination of the registration of digital products downloaded from Nintendo eShop. Digital products obtained from Nintendo eShop after this date will no longer appear in the My Registered Games & Systems page in Club Nintendo. In addition, surveys for download software titles will no longer be available. – September 30th 2015: End of Club Nintendo programme. All Club Nintendo features, such as signing up as a new member, logging in as a registered member, earning Stars, and exchanging Stars for items from the Stars Catalogue will no longer be possible from this date. 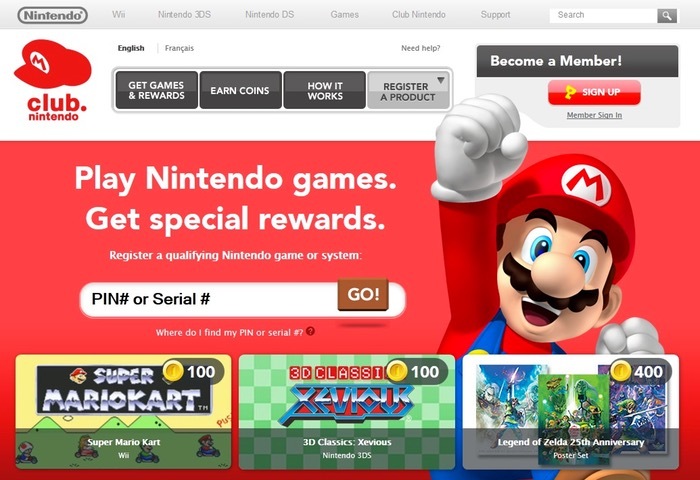 For more information on the new Nintendo loyalty programme and the closure of Club Nintendo jump over to the official Nintendo website for details.